Ompodi (or Oma Podi or Plain Sev) is a easy to make snack for any occasion. Typically made during Diwali, nowadays they are made for almost all occasions and even as a regular everyday snack. 1. Sieve the gram flour and rice flour. 2. Combine them together with salt. 3. Add little water to the ground omam/ajwain paste and strain. 4. Add the strained omam/ajwain essence to the flour and mix well with a little water and vanaspati. 5. Add some of the dough to an ompodi maker. 6. Heat oil in a deep pan over medium flame. 7. Squeeze the ompodi maker over the hot oil. 8. Fry till light golden brown and remove. 9. Because the ompodi is thin, it is cooked faster. So ensure they do not get burnt. 12. Serve as a snack. 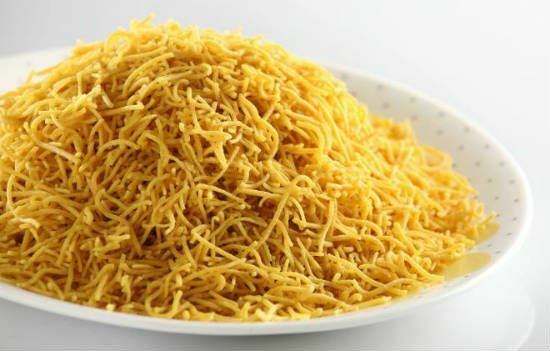 Feel free to comment or share your thoughts on this Ompodi (Plain Sev) Recipe from Awesome Cuisine.